Sucker Punch comes to Sony's next-gen console. Sucker Punch’s latest game is a PlayStation 4-exclusive about people with super powers. And it’s not inFAMOUS 3. It’s inFAMOUS: Second Son. 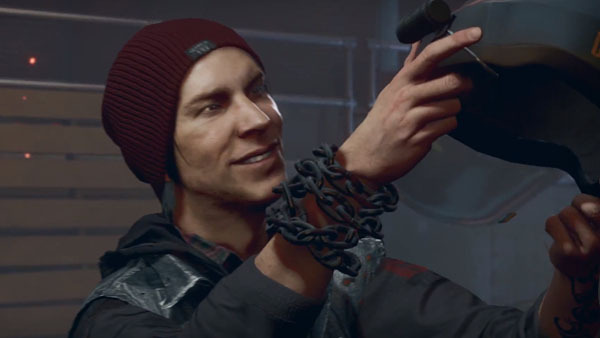 Delsin grew up just outside of Seattle, Washington—the game’s setting—where after rescuing occupants from a fiery bus wreck, he discovers he has the ability to direct, manipulate, and transform into smoke. The game takes place seven years after “the Cole McGrath episodes” and the world has “clearly changed.” Anyone showing signs of being a “bio-terrorist” is immediately handed over to the Department of Unified Protection, a government agency created to ensure a repeat of the series’ previous events never happen again. And Delsin, not a fan of authority, gets caught in the agency’s dragnet. Watch the debut trailer below.